Zandy 1.4.2, out now, is required to continue using Zandy, as Zotero is changing the default behavior of some of its APIs. Please post to the forum if you have trouble using the new version. I just released Zandy 1.3 in the Android Market— update now to get more responsive syncing, support for more attachment formats, a French localization of the interface by our kind colleague Frédéric Clavert of the Zotero Francophone blog, rich text viewing of notes and titles, and proper syncing of collection memberships. All that and support for older Android devices, running Android 1.6 and later. This release will be posted for review to the Amazon store in several days. Update 1/28/2012 9:06 pm: There were some small bugs related to the addition of Android 1.6+ compatibility that affected the 1.3.0 release. Version 1.3.2, available now, seems to fix that issue, and another affecting XML parsing. Sorry for the lack of updates in the past few weeks– the next version of Zandy should be out by the end of December. In order to make it easier for Zandy users to share their experiences and hash out improvements to the app, I’ve just set up a new forum, which you can find at http://gimranov.com/forum/. I’ll try to respond to every post there, so post away with your questions or suggestions! 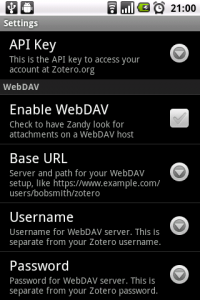 To use WebDAV, check “Enable WebDAV” and enter the appropriate information in the Zandy settings. Select a tag when viewing an item to search for other items with the same tag. This is a very naive search, and it probably fails in some cases, but improvements should come soon in 1.2.x released. You can now view and modify the collection memberships of any item; open “Collections” from an item, then tap a collection to open it or remove that membership, and select “New” from the menu to add a new membership. Item list options menu. Tap "Add by identifier" to enter the ISBN manually or to start the barcode scanner. You can now add items by entering an ISBN manually, or by scanning a bar code. To use this feature, select “Add by identifier” from the options menu while viewing the item list This feature uses the great zxing library, and it’ll prompt you to install a bar code reader if it’s not already installed on your device. For all these features, see the Zandy User Guide for more detailed instructions. This release also fixes three known crash conditions in Zandy 1.1.3 and reworks the database access to provide more reliable item saving when running multiple syncs in parallel. As always, let me know in the comments, via email (zandy@gimranov.com) or on Twitter (@ajlyon) if you run into any issues or have questions. The main bug tracker and source repository are on GitHub, for the more technical-minded. I’m happy to announce that Zandy 1.1 is now available from the Android Market. For those upgrading from Zandy 1.0, please read the Notice for Zandy 1.0 users; the transition is a little messy. Attachments. You can now download and view file attachments to your Zotero items. Tap the “Attachments” item in the item details view, then tap the attachment you’re interested in. Once it downloads, it’ll open in an appropriate viewer app on your phone. Once Zotero’s API brings support for modifying attachments, we’ll support uploads and annotations too. Notes. You can now view, edit, and add child notes on Zotero items. To view notes, go to the attachments list as above and select “New” from the options menu. Search. You can now search your library by author and title. Press the “Search” button on your device, or select “Search” from the options menu while viewing an item list. Sorting. The item views can now be sorted by title, date, and author. Browser integration. 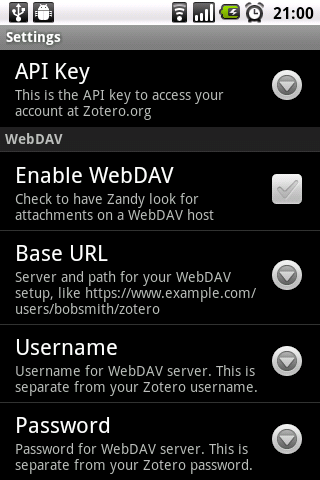 You can now send web pages to Zandy from the Android browser or any other app with a “Send” functionality. Zandy will create a web page item for the page and sync it to the server. We don’t yet support running site translators, so the item will have just the title and URL of the page for now. Collections. There was an issue in Zandy 1.0.x that prevented it from fetching all the items in larger collections. This has been fixed. Also, collections sizes are more accurately shown in the collection list. This release was significantly delayed by the release issues that made it impossible to release as a simple update to Zandy 1.0, and subsequent updates should be more frequent, bringing more important features more quickly. As always, I welcome your feedback, bug reports, and feature requests; just email me at zandy@gimranov.com, and I’ll do what I can to help out. Your satisfaction is guaranteed– if you aren’t happy with Zandy, or it doesn’t do what you need on your device, just let me know and I’ll refund the purchase price. On the Android Market, Zandy 1.1 is being released as a product distinct from Zandy 1.0.2. This is because I have lost access to the release keys used to sign the first release, so the security measures in Android make it impossible to simply release it as a free, automatic update. The Zandy 1.1 release is essentially ready to be released, bringing with it many improvements, from cleaner item display to viewing attached PDFs; from item search to sorting. So I definitely want to get it out to all of you who have supported the project in this first month. Unfortunately, there is no clear way to provide this update for free to all those who bought Zandy already, which I very much want to do; after all, I promised in all sincerity that buying Zandy was a one-time affair. To get the new version of Zandy, it will be necessary to remove Zandy 1.0 from your device and buy Zandy 1.1 separately from the Android Market. For those who bought Zandy 1.0, I will refund 100% of the purchase price for Zandy 1.1; just drop me a line at zandy@gimranov.com and I’ll handle it immediately. You’ll need to indicate the name on your account so I can credit it properly. If buying the software again and having the cost refunded is not a workable solution for you, I can also provide you with the installation file (APK) for Zandy 1.1, and you can install it manually. The drawback of this approach is that the application will not update automatically. Still, I will be glad to provide you with updated APKs for each subsequent release of Zandy if you choose this method. If you choose this method, send a message to zandy@gimranov.com and indicate the name on your account, and I’ll send you the installation file. I’m very sorry to all of you for causing this inconvenience. Zandy was my first foray into Android programming, and I have taken proper steps to ensure the security of the code signing key so that such blunders will not be repeated. I’m looking forward to months and years of new releases of Zandy, to make it the best way to use Zotero on your mobile devices. Bear with me, and we’ll make it happen. If you have any questions about the upgrade process or Zandy in general, please do contact me at zandy@gimranov.com. For details on what’s changed in Zandy 1.1, see the release announcement. The Zandy logo. Read the "ә" as in Tatar or Azeri, it's "ä" like in "cat". For Zandy documentation, see the Zandy User Manual. Enjoy! In early August, after many months of exhorting others to write clients for Zotero for platforms like Android and iOS, I finally decided I might as well try to do it myself. For about a week, I worked on the project in the evenings, often until the morning, trying to get back in the swing of things with Java. It’d been a long time, but the Android documentation is pretty comprehensive, so I managed. The second push to make a publishable product happened last week, and I finally managed to make something I wasn’t afraid to have other people use. When it came to publishing, though, I had a lot of trouble deciding how to distribute the software. I had built in part off of some GPL-licensed code for a Mendeley client (Martin Paul Eve (University of Sussex), hosted at https://code.google.com/p/mendeley-for-android/), and I wanted to release the code under a free license anyway. But I’ve been putting in serious hours on Zotero-related things for almost two years, and I can’t say I’d mind establishing a new income source, especially since mobile apps are something people are usually willing to pay for. So I published the code under the Affero GPL on GitHub (https://github.com/ajlyon/zandy/), and published the app itself in the Android Market, first at a price of $7, and, after seeing concern about the price from people I respect, at $3.99 (I offered partial refunds to those who bought it at the original $7 price). This first version was rather limited, but it did provide, for the first time, a way for people to access and modify their Zotero databases from a mobile device. Sales have been a bit slower than I had hoped, perhaps because I made some design choices that limit Zandy to Android 2.2 and higher. I was surprised to see that most of the sales are from outside the US– only 10% from the United States. I also provided the installer for free to interested developers; since anyone can take the code and build the APK and install anyway, there’s no point in annoying the interested by requiring them to do that. That version has been downloaded, it seems, six times by people using mainly late-model Android devices: WOW64 (x2), Nook Color, Nexus One, Droid, HTC Desire (x2). The initial release turned out to have a few bugs, and one of them was preventing people from logging in to the Zotero server, and another was preventing people from entering their Zotero credentials manually. Both, I think, have now been ironed out, and the next release (1.0.1), will being going out tomorrow (Sunday), with those fixes. Item editing using Zotero 1.0.0. Item editing will be somewhat improved for 1.0.1. There were also a lot of feature limitations. It was possible to modify creators and their roles, and to add, delete, and change tags, but Zandy couldn’t add tags to an item that didn’t already have them. Also, it could be told to sync the entire library, but that sync would fail on larger libraries with lots of collections. Both these issues have now been fixed. I also really wanted to add new item creation. One of the great things that Zandy could enable is working offline, in a place like a library, archive or some other field site, and simply adding the items you need, to be synced up later– this is my mode of operation when working in Russian libraries without electronic catalogs, so it matters that this work right. I’m working on finishing that feature up right now, and it should make it into the 1.0.1 release for tomorrow. Documentation is also in need of serious work– it’s mainly nonexistent. So look for some built-in documentation as well as a new page with a guide and troubleshooting information. You can follow progress towards the Zandy 1.0.1 milestone on GitHub. My main goal for Zandy 1.1, which I hope to get out in under two weeks, is to provide proper access to item attachments in Zotero. Right now, I don’t provide any way for people to work with notes, be they child or standalone, or to links and files attached to items. The API makes accessing attached files (those stored in Zotero File Storage) pretty easy, so it should become possible to download those files on demand and send them to other Android apps to be read and even annotated. Unfortunately, it’s not yet possible to upload files using the API, so annotations won’t yet sync back to your library– we’ll need to find a way to convert them into notes in the meantime. Notes editing should be an easier affair, but we will need to find a way to make rich text editing in Android work in a way that makes the notes show up correctly in Zotero as well. Other things on the way, that may or may not make it to Zandy 1.1, are searching within the local library, which will make it possible to do things like browse by author or publication, and autocomplete in fields. I’m also trying to work out what can be done to make Zandy play well with other apps on the Android platform; the Scanner for Zotero app does a great job integrating with a bar code scanner app, and cross-app integration like this is something that will eventually make its way into Zandy. You can follow progress towards the Zandy 1.1 milestone on GitHub. 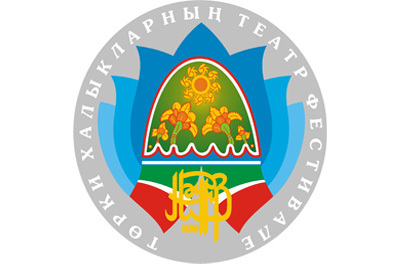 The Chuvash State Puppet Theater’s Flop-Eared Ilyuk opened the 2011 Nauruz Festival on May 30. The 40-minute marionette, performed solo by Yurii Filippov, the tale of a young elephant’s adventures as he makes the long journey from his home and loving parents in India to the far-off land of Chuvashia, where he has promised to meet his dear friend, the Chuvash beauty Hevedus. The play is unassuming, quietly affirming the beauty and value of one’s native land and language. Russia has a long and underappreciated tradition of puppet theater, and Fillipov ably continues that tradition.